Use shaving cream in the bathtub (on the tub or walls) to have your child write, scribble or draw. This gives your child an opportunity to practice fine motor and writing skills, it is easy to clean up and it smells great. Ask your toddler lots of questions about their drawing/writing. Ask your toddler if you can write the words on the bottom to narrate the picture or story. This will give meaning to their picture, words, and writing. 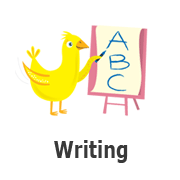 Many toddlers are entranced by the written word and that items spoken can actually be written down. Draw together. Have a caregiver draw shapes, objects or characters and your child can color or imitate the drawing. Drawing can be a family event.